Well, the 2013 season was over three plays into the Ohio game. A Bobcat team that had been terrible lately ran over and through the UMass defense. Ohio had 461 yards of offense and averaged 7.9 yards a play. BOTH our starting quarterbacks threw INT's for touchdowns. Doyle went 4-12-102 2 INT 1 TD. Wegzyn went 2-6-28 1 INT. There wasn't much to hang your hat on for good news. Abrokwah had 110 yards. Levengood was 2-2. Dan Malone says UMass finishes 1-11 for the second straight season. Ohio was the last game for 17 seniors. Matty V. said the Minutemen closed the season with 23-51 loss. UMass write up for the game. Ohio website reports on the game. All the MAC scores. Bowling Green handled Buffalo to win the MAC East. Akron, which had a great comeback season, upset Toledo and Eastern Michigan finished 0-12. UMass closes the season another double-digit underdog. With Blanchflower out, the offense will probably continue to struggle. The Bobcats will put eight in the box and dare UMass to throw the football. If we could avoid turnovers, maybe the defense can keep it close. Ohio has been in a late season swoon. If the defense could get a couple of turnovers, maybe it will jump start the Minutemen offense. However, the UMass defense did just that against Akron with no results. I'm not a Black Friday shopping person, so I'll be in front of the computer hoping UMass will win. Hope everyone had a good Thanksgiving and Go UMass!!! Matty V. says Coach Molnar will be back next year. Dan Malone also has a story on the vote of confidence from John McCutcheon. Coach Molnar discusses the team's progress. Hustle Belt says Molnar will return. The Boston Globe says UMass staggers to the finish line. Dan Malone says the Minutemen look to close out the season on a high note. Besides UMass-Ohio, two other MAC games will be on ESPN3 today. Cleveland.com says Bowling Green plays for a title, Akron is trending up and Ohio is trending down. UPDATE: The UMass Marching Band was on about 10:43. The commentators talked over some of it, but the visuals were good. Go UMass! Mrs Blog and I would like to wish all UMass Football family blog readers, friends, players and coaches a Happy Thanksgiving. Especially so to the football team and coaches, who are probably stuck in a motel somewhere in Athens, Ohio. UMass has its game notes for Ohio up. The UMass website has a Q &A with Minuteman punter Jeff Strait. 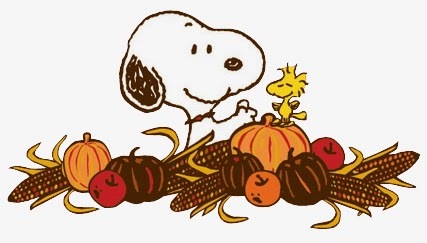 The Macy's Thanksgiving Day parade kicks off at 9:00 AM. Be sure to catch the UMMB's performance. Hustle Belt talks about the collapse of Ohio Football in November. Hustle Belt also has the TV schedule for the league's Black Friday games. Playing on a weekday in the afternoon on the biggest shopping day of the year ---- easily the best idea since the Iraqi invasion. Fresno State and NIU present a BCS Bowl puzzler . Coach Molnar discusses breaking Shadrach Abrokwah's redshirt. There's no bio information in for Abrokwah in the UMass press guide or on the website. ESPN Boston had this back in May. "The 5-foot-8, 205-pound Abrokwah was one of the state's most productive backs last fall for the Pioneers, as they advanced to the MIAA Division 1 Central Super Bowl. In 2012, his first season as the Pioneers' full-time starter, he carried the ball 213 times for 1,540 yards and 22 touchdowns, with just one fumble; he also caught 21 passes for 437 yards and two more scores. Abrokwah has reportedly run a hand-timed 40-yard dash in the 4.5 range. " The article also says Rob Blanchflower is out for the Ohio game. Dan Malone says A.J.Doyle is struggling but still confident. The Sentinel and Enterprise says Rob Blanchflower's Minutemen career is over. The MAC Report Online says Blanchflower finishes as UMass' #1 TE. Matty V. says Blanchflower is done for the season. Coach Molnar's quotes from the MAC Weekly teleconference. Ohio University Wins Enterprise Rent-A-Car's "Best Under-The-Radar NCAA Football" Competition. I watched NIU's Jordan Lynch break his own NCAA record for rushing yards by a QB last night. Hustle Belt says Ohio will beat the spread against the Minutemen. ESPN Boston says UMass basketball and Derek Kellogg are enjoying life in the fast lane. 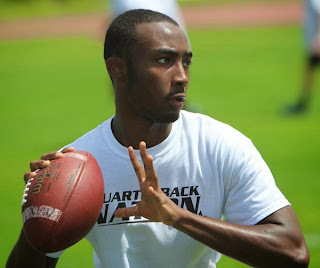 Several recruiting services indicated UMass has offered to Jerrell Antoine, a 6-1 160 pound Athlete/QB from Orlando, FL. Recently threw seven TD's in one playoff game to tie Tim Tebow's Florida record. Also threw for 2,988 yards in 2013. Quote from the article:"I have the best quarterback in the state of Florida on my team," Williams said. "He's only 165 pounds soaking wet, but he's like Johnny Manziel. He never takes a big hit, and he makes all the throws." Also has offers from Florida A&M and Louisville. Keepers College Football ratings has Ohio a 11.87 point favorite over the Minutemen. Las Vegas has Ohio by anywhere from 14 1/2 to 17. Dan Malone comments on the odds. UMass is 121st of 123 FBS teams in scoring offense. The Minutemen average 10.7 points a game. That's 2 points a game lower than the 12.7 points a game the offense scored in 2012. NIU is ranked #14 on the latest BCS poll. That puts Northern Illinois ahead of Fresno State for a BCS bowl bid. The Huskies play the 1-10 Western Michigan Broncos tonight at home. Central Michigan has two players on the league's player-of-the-week list from last Saturday's waxing of UMass. Buffalo's Khalil Mack is a finalist for the Butkus Award. More on the UMMB's trip to play at Macy's Thanksgiving parade by the Hampshire Gazette, Greenfield Recorder and Wicked Local Waltham. Forty-Two percent of the public (probably male public) would take college football tickets over Thanksgiving dinner. UMass hoops returns to the Top-25 after 15 years. BTW, James Madison fired Mickey Matthews. The UMMB will perform in this year's Macy's Thanksgiving Day Parade! Go UMMB. Hope some of the NYC UMies get to hear the band. Bryon Vance has the second-to-last MAC power rankings. UMass is second to last in those also. Matt Daley has the latest MAC bowl projections. NIU moved up in both the AP poll and the Coaches Poll. Someone in the comments said UNH would get an at large bid at FCS playoffs at 7-4. Not only did the Wildcats get a bid, they got the easiest draw in the first round. Maine gets a #5 seed and a home game. Congrats to UMass hoops for winning the Charleston Classic. The game went bad early as Central Michigan scored on their first possession and UMass' offense went backwards about 20 yards on ours. UMass was not competitive in any portion of yesterday's game. A. J. Doyle had another bad game.He went 6-13-45 with 3 INT's (one for a CMU score). The cold weather and wind did not bother Central Michigan's Cooper Rush who went 13-21-231 yards and 2 TD's. Rush pretty much had his way with the UMass secondary; whenever CMU needed yards, they got it passing. CMU went 4-4 in the redzone. UMass' one entry was stymied by another Doyle INT. When Rob Blanchflower does not play, the Minutemen passing game comes to a total halt. No other receiver even sorta picks up the slack. Besides the QB, UMass also needs a big infusion of speed and talent in the receiving corps. The Miinutemen did shut down the Chippewas running game, holding CMU to 65 total yards rushing. UMass continues to burn up running backs. They broke Shadrach Abrokwah's redshirt yesterday. He must have been about sixth on the depth chart at the start of the season. It seems like UMass running backs last one game before being semi-permanently injured. I don't know if anyone picked up on the ESPN3's commentators comments on UMass' struggles. They said UMass only had about 50 scholarships at the I-AA level and after the transfer of 10 players, UMass bottomed out with about 40 scholarships in 2012. If this is true, then that would be the reason Brown left, and it would be the reason UMass struggled in their last three seasons in the CAA. If UMass is barely at the I-AA level for scholarships after two seasons in FBS, then it's going to be another couple of years before there's much improvement. UMass writeup on the game. Paul Bowker of MassLive says UMass routed. MassLive says Abrokwah shined in his first game for the Minutemen. 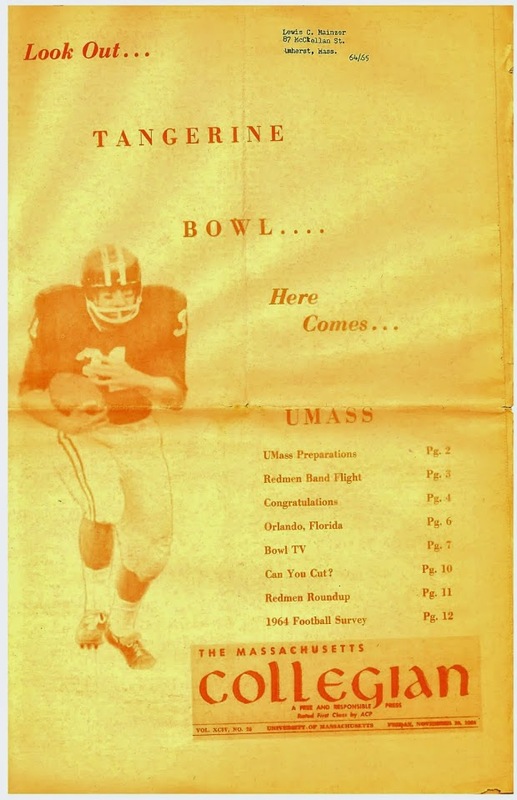 The Hampshire Gazette said the UMass offense stalled out. UNH whacked previously undefeated Maine. As I predicted, UConn picked up their first win over hapless Temple. UPDATE: This is painful. A.J. Doyle has 2 completions and 2 INT's. The Minutemen defense is pretty much on their own. Both team's relative positions have not changed much since last year. If CMU wins out they are bowl eligible. The MAC probably won't get as many bowl bids as 2012, so Central Michigan probably will not get a bowl bid even if eligible. The Chippewas were blown out against Michigan (9-59) and North Carolina State (14-48). They have a three point win over New Hampshire (24-21). They have close wins over Western Michigan, Miami and Ohio. CMU has been without their headliner RB Zirlon Tipton who has played in only four games so far in 2013. He's 38-133 3 TD's in 2013. CMU is a more balanced team this year in offense, but that will change with Tipton back. Even without him, they 4.9 yards a carry to their opponents 3.7. They've been averaging 20 points a game to UMass' 11.7. Last year, the Minutemen led into the third quarter. CMU took the lead, then A.J.Doyle threw two INT's giving the Chippewas the ball on the UMass 9 and 42 yard line. CMU scored the final 28 points to push a close game into a runaway. On paper, the two teams are pretty close. I expect the UMass defense to play well again. However, 11.7 points won't win it. If the offense could generate 20 points or so (something they have rarely done), it could be a close game. If not, expect the Minutemen defense to tire in the fourth quarter and another double digit Central Michigan win. I'll be watching the game on ESPN3 with my UMass gear on. Hope the rest of the UMass nation will too. Go UMass!!!. The Hampshire Gazette's Mark Chiarelli says the Minutemen look to derail CMU"s bowl bid. Jimmy Kelley of Hustle Belt predicts a 31-17 Chippewas victory. Bowling Green vs EMU will be the other MAC ESPN3 game today. The MAC blogger round table says the dust is starting to settle. I think winless UConn has a good chance against 1-9 Temple today. The annual UNH-Maine grudge match will be played today. UNH needs a win to get a at-large birth in the playoffs. If Maine wins they will be 8-0 in CAA play. Matty Vautour says Coach Molnar is committed to A. J. Doyle as UMass' quarterback-of-the-future. The article says the UMass coaching staff is not making a big push for a JUCO or fifth year transfer. I dunno about this. We're 12th in the MAC in scoring offense, 12th in total offense, 12th in total offense, 12th in passing offense and 11th in passing efficiency. Minutemen quarterbacks have thrown 12 INT's and 8 TD passes. The defense has arguably played well enough for UMass to be 3-3 in league play. With a better offense, you could probably add a victory over Maine and we could have put a scare into BCS Vanderbilt. Doyle has not been able to shake the injury bug. I would really like to see him catch fire, but can the program stand another double-digit loss total in 2014? In football, competition is good. If it were me, I'd strongly look for a JUCO or a fifth year gunslinger. One or two years would not derail Stafford's or West's career. As I said in last Sunday's post, I saw UMass fans still buying Minutemen stuff after the Akron loss. The fanbase wants to get energized. I realize how big a jump we're making, but in 2014 UMass really needs some wins. Michigan Live says CMU looks to keep its bowl hopes alive against the Minutemen. The Boston Globe says Coach Molnar is staying positive. ESPN Boston reports UMass is preparing for Central Michigan. While surfing for football last night, I came upon UConn-Boston College. Who to root against? The win over UMass brought Terry Bouden a contract extension. Some big names mentioned in EMU's coaching search. I didn't think I got a good image of the seniors at Saturday's game. Looking at my images, I found one decent, but not great image. They didn't group up and face the stands much prior to being introduced. I passed through Amherst yesterday and took a couple of images of the McGuirk construction. UMass has its game notes for Central Michigan up. UMass fans will be able to watch the last game of the season against Ohio on ESPN3. The Bobcats have been having their problems lately. Maybe the Minutemen can steal a win. NIU had a big second half to win the MAC West crown last night against Toledo. Hustle Belt has more on the Huskies 24th straight conference win. SI.com looks at the coaching hiring and firing status so far in 2013. The MAC (page two of article) has two vacancies and at least three league coaches may get offers to move up. When you're talking college football rivalries, you're talking Cortland-Ithaca. 247 Sports indicates UMass has offered to Alex Ogle, a 6-3 196 pound Pro-style QB from Jensen Beach, FL. Threw for 2,235 yards and 18 TD's in 2013. MaxPreps has Ogle's complete stats. This article from August features Ogle. Also has offers from FIU and Florida Atlantic. Dan Malone says Coach Molnar praised the UMass defense for the Akron game and looks to the future. CMU's Zurlon Tipton is a great sports name and he'll be back in action for Saturday's game. Last year Tipton had a career high 25-185 4 TD's 61 LONG 7.4 AVE. He only lost 1 yard rushing. Tipton tripled the UMass running totals as the Minutemen rushed for 64 yards. Rob Blanchflower had 10 catches for 100 yards. In CMU's win last week over Western Michigan, Tipton and Chippewas' WR Titus Davis combined for 236 of CMU's 285 total yards. Central Michigan has its game notes for UMass up. The UMass website has quotes from Coach Molnar's weekly MAC teleconference. Randal Jette was an honorable mention for CFPA's defensive player-of-the-week. In yesterday's MACtion, Buffalo and Kent State rolled to big wins over Miami and Ohio. NY Giants Blogger Ed Valentine thinks the Pats got hosed on the final play of the Panthers game (last paragraph). James Ihedigbo and Cleveland's Greg Little avoided fines for their scuffle back on November 8th. NCAA.com ranks the five most iconic college football uniforms. A new hot recruiting area for punters------ Australia. ESPN reports UMass has offered to Mike Adens, a 6-3 215 pound dual-threat QB from Pierce College in Woodlands Hills, CA. 247 Sports.com has him as the #3 dual-threat JUCO QB in the nation (scroll down). Dan Malone has three helmet stickers for the Akron Game. Brandon Levengood's two field goals moved UMass over .500 (9-16) for the season and into a tie with Buffalo for 9th place in the league. The NY Times has an article on former UMass RB Michael Cox. Cox has taken over kick returns for the Giants. Akron DB Malachi Freeman was MAC Defensive Player-of-the-week for his efforts against the Minutemen on Saturday. Hustle Belt's Keith Scheessele says CMU will beat the spread against UMass. Hustle Belt has five names for the next Eastern Michigan HC. USA Today looks at college football league bowl races. The MAC already has six bowl-eligible teams. ESPN reports UMass has offered to Otis Kearney, a 6-0 190 pound Safety from Toms River, NJ. This article from October talks about his recruiting. Ran for 172 yards on 11 carries in a recent game. 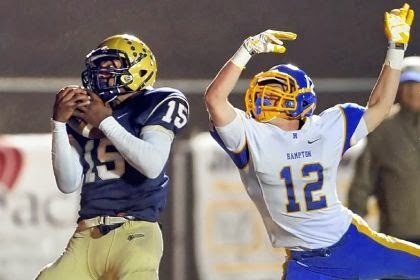 Besides UMass, Kearney has offers from Michigan State, Buffalo and Old Dominion. I didn't know my old hometown newspaper, the Greenfield Recorder, was still online. It turns out it is and has a late penalty hurts in UMass' 14-13 loss. Hustle Belt covers next week's foe, Central Michigan's win over Western Michigan. Las Vegas odds are split between 8 1/2 and 9 1/2. NIU is ranked #16 in the BCS standings. Matt Daley of Hustle Belt thinks the MAC will get five bowl teams--- and maybe six. Speaking of bowls, Boston College became eligible. Blea. UConn is still one of the five winless teams in FBS. There are also six undefeated teams. The stats for yesterday's game were virtually identical as you would expect for a game with a one point differential. Again, the defense played well enough to win again holding Akron to 14 points, the same as last year. Mistakes lost the game. We had a dropped touchdown catch. We had a weird penalty on a defensive stop near the end of the game. The Minutemen defense created three turnovers and UMass did not capitalize on any of them. The offense was stopped on a critical fourth-and-one. The coaching staff botched a chance to call a time out at the end of the game, although that was moot with the unsportsmanlike penalty call on Anderson. Nice day though and 10, 599 fans showed up for an all-time season record in UMass attendance. People were still buying UMass gear at the UMass shop on the way out of game. Now if we could only get some wins to reward them. Matty Vautour says the one point loss was a gut-shot for UMass. Dan Malone reports UMass drops a one point loss to Akron. Dan has more on the 15,000+ per game attendance. Dan talks about how the Minutemen seniors formed a football brotherhood. The Boston Herald says it was a foul ending. Two articles on Rob Blanchflower's breaking Milt Morin's TE reception record one from the Worcester Telegram and one from the Sentinel and Enterprise. The MAC Online says a rare receiving TD by Jawon Chrisholm that won the day for the Zips. Byron Vance of Hustle Belt says Akron battled back to beat UMass. Maine beat Rhode Island 41-0 to win its first outright league title since 1965. Kansas State won to become bowl eligible. #22 Wisconsin rang up 554 yards rushing on Indiana. Vanderbilt beat Kentucky to also become bowl eligible. Well, we're back. A little jet-jagged and not much sleep, but we're getting ready to go to Gillette.The weather is supposed to clear and the temperature hit 59 degrees! Last home game for the Seniors. Let's all show up and cheer them on. UMass should be an underdog in this game. Akron has improved a lot since last year. The Minutemen have improved, but not as much. Hopefully, Rob Blanchflower will be able to play. The UMass offense works much better when he's in there. Let's run the ball, get some turnovers and win the game. Parking lots open for tailgating: 10 a.m.
Minuteman March at 10:45 a.m. Be sure to join the Minuteman Marching Band and UMass Cheerleaders in Minutefan Park to welcome the team to the stadium. The Minuteman Club opens at 11 a.m. Tomorrow is Senior Day. Be sure to get into Gillette Stadium in time for the special pre-game ceremony honoring the 18 players — 15 seniors and 3 graduate students — who will be competing in their final home game for the Minutemen. This game also will provide an opportunity for fans to get one last Gillette Stadium look at the incredible Minuteman Marching Band before they head to New York City to be part of the 2013 Macy's Thanksgiving Day Parade. Most important, though, it's looking like a gorgeous day in Foxborough, sunny with a high of 54, perfect weather for cheering on the Minutemen as they attempt to repeat last year's success against Akron. The Minutemen topped the Zips 22-14 in Akron to get their first win of the FBS era a year ago. Information on Gillette Stadium, tailgating and activities is available here. Gillette Stadium now features WiFi throughout the facility. Bring your devices and follow stats, follow UMass Football social media throughout the game, and share your thoughts, images and video. Tailgate Tent: Join the UMass Amherst Alumni Association at their official tailgate tent, part of Minutefan Park. Patriots Alumni: Each game this season has brought a New England Patriots alumnus to the Minuteman Club to sign autographs and talk football with UMass fans. This week, meet John Smith. John, who grew up in Southampton, England, didn't know anything about American football until he came to America to coach at a summer soccer camp as a university student. He discovered a talent for kicking an oblong ball, got a contract, and served as was Patriots placekicker for 10 seasons. John is perhaps best remembered by Patriots fans for his part in the 1982 Snowplow Game, putting up the only points in a 3-0 victory over the Miami Dolphins. He's remembered nationally as the player who was lining up to kick a field goal on Monday Night Football in 1980 when Howard Cosell broke the news that John Lennon had been assassinated. 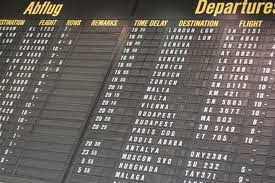 Start making plans for 2014. Next year, the Minutemen will split their home schedule between McGuirk Stadium on campus and Gillette Stadium. They'll open the 2014 season by hosting the BC Eagles at Gillette Stadium August 30. Details on the rest of the home schedule, as well as information about season ticket packages, will be available soon. Dan Malone says Doyle, Blanchflower and Byrne will all play in the game. Trey Dudley-Giles is "Probable". Shane Huber and Derek Beck are out. UMass has already sold over 8,000 tickets for the Akron game. That will be a new record high in UMass home attendence and will avoid NCAA probation. The Morning Call.com has an article about Galen Clemons' efforts to combat violence against women. The Cleveland Plain Dealer looks at today UMass-Akron game. Due to this week's MACtion, Central Michigan against Western Michigan is the only conference game today. Maine gets a chance to clinch the CAA Championship today. Leaving on a jet plane... Mrs Blog and I are back to New Hampshire today. We enjoyed our mini-vacation here in San Diego. Lots to do in sunny Southern California. Gotta ask Todd Bankhead some time if being a native makes the freeway traffic easier to deal with. We get into Manchester early in the AM Saturday and then I've got to turn around and get to Gillette. Whew! I'll be needing a vacation from the vacation. Akron finally has their game notes for UMass up. The Boston Globe says the UMass seniors helped shape the Minutemen program. Galen Clemons introduced the Minutemen team to the White Ribbon Campaign. UMass football is doing a lot of good things. Hopefully when we'll start winning so those things will be recognized. Jimmy Kelly of Hustle Belt asks if UMass can beat the Zips again. Hustle Belt's blogger round-table looks at the MAC's post-season possibilities. NIU's mascot Diesel, had a highlight moment at Wednesday's game. SB Nation looks at the Week #12 BCS rankings and has NIU at #15. USA Today rank at each state in relation to their college football teams. At least we are ahead of Connecticut. Jeremy Cain signed with the Chicago Bears. Saturday will be Senior Day at Gillette. Hope a lot of UMass fans will turn out to honor the Seniors; they've certainly been through interesting times. Still no game notes from the Akron side. A.J. Doyle looks to return to starting QB Saturday despite some nagging injuries. Coach Molnar reflects on his first win as a head coach one year ago at Akron. Matty Vautour reports Doyle expects to start Saturday. The UMass Daily Collegian says the Minutemen are hoping for a win against the Zips. CBS Sports says Ball State made a game of it, but NIU's Jordan Lynch wore out the Cardinals. The win pushes the Huskies to 10-0 and closer to a BCS game. If NIU should be chosen, it would be a financial boost for the entire MAC and UMass. The non-BCS leagues also split TV money by ranking and NIU's potential BCS game would help in that regard. On the other end of the line, Kent State beat Miami to push the Red Hawks to 0-10. The "Hail Mary" tip is now just a footnote in James Ihedogbo's life. The UMass website reports the UMass-Central Michigan away game will be broadcast by ESPN3. Coach Molnar's comments from the weekly MAC teleconference. Lebanon Sports Buzz features UMass kicker Brandon Levengood. Last night in mid-week MACtion, Bowling Green crushed Ohio and Toledo laid 51 points on Buffalo's supposedly killer defense. The MAC website also has a video on the league's relationship with ESPN. The Dekalb Daily Chronicle says MACtion benefits the football teams and the MAC universities. ESPN says former NIU coach Joe Novak gave the Huskies a great legacy. A NIU fan says the Huskies are streaking. Tonight's Ball State-Northern Illinois could be the game-of-the-year in the MAC. 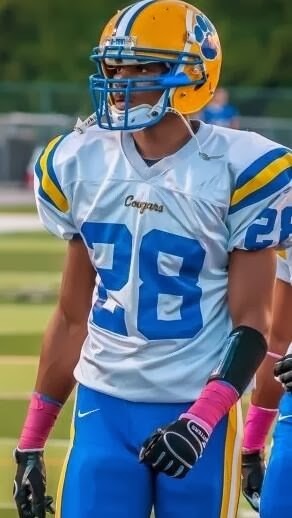 ESPN shows UMass has offered to Brandon Feamster, a 6-3 200 pound Safety from Downington East HS in PA.
Hudl.com has some highlight video from this year's games. Feamster has an offer from Temple. Drawing interest from Northeast teams Boston College, UConn and others. Dan Malone reports out of a second bye week UMass tries to get healthy. Coach Molnar said A.J. Doyle and Rob Blanchflower did not practice last week and may play against Akron. No news about Shane Huber who went down with an apparent knee injury against NIU. One of the UMass WR's also left the game with a shoulder injury (I didn't catch his number). Hustle Belt says take the Zips and lay the points. The MAC has two of the biggest league games of the season mid-week. Buffalo is looking for their eight straight win. The Ball State-NIU game features the best two QB's in the MAC. Zack Harig previews tonight's Buffalo-Toledo matchup. NIU and Fresno State are tied atop Hustle Belt's Mid-Major Poll. Stanford's win over Oregon has created a national ripple in bowl projections. Good Morning from Coronado Island, San Diego. This week's opponent Akron has six verbals for 2014---- half of them from Beaver Falls, PA.
Back on October 12th, the Zips played a lot better against NIU than the Minutemen. Keepers College football ratings have Akron a 7.52 favorite over UMass. NIU is ranked #15 in the BCS ratings this week. The Huskies dropped one notch in the Coaches Poll. Matt Daley of Hustle Belt looks at the bowl outlook for the MAC in Week #12 and prognosticates a number of bowl-eligible MAC teams will be left out. Ball State and NIU are this week's MACtion. James Ihedigbo was a hero with 2 INT's Sunday, then a goat, then a hero again. Brandon London blocked a punt, but the Larks lost in the CFL's East semifinal. BTW, nice win by UMass hoops yesterday. If 1998's National Championship season seems long ago, so does an appearance in the NCAA's for Minutemen Basketball. Mrs Blog and I will be making the drive down from New Hampshire seven times this year to see UMass hoops. Bryan Vance of Hustle Belt has Week #12 MAC power ratings. After those teams, the league does not much of a middle. Ohio could finish around .500 and the rest are in the bottom 20 of all FBS. The Audio that got Ron English fired is available. The Detroit News says the players can't be blamed if they didn't want to play for Ron English. The Eagles promptly won an overtime game against WMU. The Eagles drew 2,177 fans in Ypsilanti to cement their attendance as the league's worst. Maine beat Albany to keep the best start in Black Bear history going. Maine's 9-1 start is the best in their 121 years of playing football. Boston College beat 1-9 New Mexico State. UConn lost on Friday to run their record to 0-8. Football Scoop has the prognosis for the five remaining winless teams in FBS. Kansas State upset Texas Tech. The Cats only need one more victory to be bowl eligible. UMass could again have the unenviable status as a team who played eight bowl teams in one season. If Central Michigan wins out, it could be nine. Dan Malone, referencing Bob McGovern, says Da'Sean Downey, a 6-5 250 pound strongside defense end has verbaled to UMass. Jimmy Kelly of Hustle Belt also comments. Downey has been taking a prep year at Canterbury High. Hudl.com has video highlights. Downey drew mostly FCS interest prior to his prep year. Good Morning from Carlsbad, CA. Click on image and blogger displays a larger view. Not much UMass football or MAC conference news on the intertubes today with the Minutemen having an off week and the MAC with only one Saturday game. One game on the MAC Conference schedule today: one win Western Michigan meets one win Eastern Michigan. Eastern Michigan fired Ron English yesterday. That's the second MAC coach to be released before the season is over. UPDATE: Coach English may have been fired for "inappropriate" language. The MAC Report Online has the conference power rankings as of November 7th. Brandon London, who has been benched recently for low production, looks to erase some bad memories in the CFL playoffs. I've missed Matty Vautour's coverage of UMass football this fall. It turns out he's been on partial paternity leave to help with his newborn son's treatment at Boston's Children's Hospital. Mrs Blog and I wish his son a speedy recovery and hope he thrives from now on. Matt was always friendly and willing to talk to me when I met him at various UMass football functions, and that was a sharp contrast to several other of the "professional' media I had the misfortune to interact with. Matty is a good man, a good reporter and he'll be a great dad. Mrs Blog and I conclude a busy travel year with a trip to San Diego to attend a wedding. We'll be out on the West Coast for a week. As usual, I'll try to keep the blog going if possible. I've blogged about UMass QB commit Randall West four times before. West suffered a knee injury in last Saturday's game against Blair Academy. UMass has announced its 2013 Hall-of-Fame Class. Included from football is Ned Deane. Dean was a First Team All-America for the Minutemen in 1975. He was also First Team All Yankee Conference in 1974 and 1975. Deane was Captain of the 1975 Minutemen. The UMass website has more on the 2013 Class. Devin Brown has been named to the Capital One District One All-Academic Team. Brown is also a Dean's List student and a member of the University's Commonwealth Honors College. Congrats to Devin for his good work on the field and classroom! The MAC Conference admits its officials blew two calls in the Ohio-Buffalo game. I haven't been impressed with the officiating at the UMass game either. Athlon Sports said it was one of the worst calls in officiating history. The Buffalo Bulls are building for long term success. Keepers College football ratings have Maine a big favorite to remain unbeaten in FCS this weekend. The Wall Street Journal has the odd economics of Stanford football. Any former UMie could have told them this. Researchers have found beer can be as good as therapy for some. 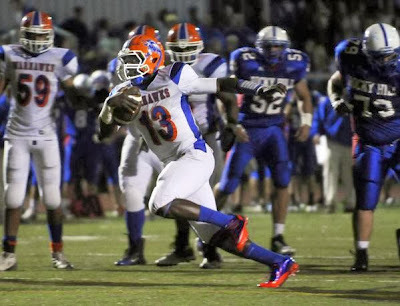 I've blogged about UMass 2014 commit Norvel Stewart, before. 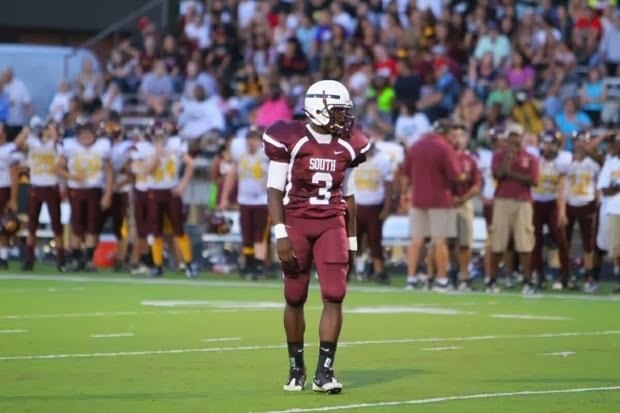 Stewart has 304 yards of total offense and scored four TD's in an October game against Platt HS. Stewart has over 1,700 yards of total offense this year. MaxPreps has his senior stats. Brendon Levengood received two more weekly honors from ECAC and College Performance Awards. The Pointsettia Bowl's website here. Out of the 125 FBS coaches in the country, Coach Molnar's compensation ranks 102nd. USA Today has FBS football coaches contract quirks. Matty V. says the Minutemen look to finish the season on a high note. A cut-and-paste from Matty's article on a scrimmage UMass held for redshirts and other players who have not had any game action in 2013. I've added links so you can check bios. I watched Ball State beat CMU last night to say unbeaten in the MAC. Midweek football games gives the MAC national exposure, but create attendance problems. Prediction Machine.com says NIU and Fresno State are two of six teams likely to remain undefeated. Minutemen fans would hope Fresno State is upset, so as to allow NIU to get a BCS bowl. That would be a financial windfall for the MAC and UMass. The same website has UMass #120 out of 125 FBS teams. I've blogged about 2014 UMass commit Charan Singh before. This article from October features Singh. At 6-2 192, he's a professional football sized DB. Hudl.com has some video highlights from his senior season. MaxPreps has Singh's 2013 stats. Dan Malone contemplates the Minutmen's blowout loss to NIU and finds only two helmet stickers for the game. Lorenzo Woodley looks to be part a an excellent stable of UMass running backs. Woodley and the rest of the running backs need a better offense around them. Brendon Levengood was the first happy surprise of the 2013 for the offense. With three games to go, hopefully he'll get a game winner. If A.J. Doyle is indeed out for the season, who's the #3 QB for the Minutemen? Matt Quinn? Todd Stafford? In MACtion, last night, Bowling Green blew out Miami 45-3 and Buffalo beat Ohio 30-3. I watched the Bulls-Bobcats game and it was a virtual clone of Buffalo's win over UMass (minus the 48 degrees and driving rain). Buffalo dominated the second half to beak open a close defensive struggle. Balls State has a chance to join NIU and Ohio State as the only nine-win teams in the country when they play Central Michigan tonight. Over at Akron, Terry Bowden is making visible progress. Meanwhile James Ihedigbo honeymooned in Bora Bora.